There are many industrial fans manufacturers, but what do they do really. In reference markets, the term “industrial fan” does not have a clear definition and in this article we want to explain what are industrial fans, and answer to many other questions. The most significant data of this comparison are the weight, the speed of operation and the noise. The comparison of the speed of operation indicates that the same flow and pressure characteristics are obtainable by axial fans in higher operation and peripherals speeds than those of the centrifugal fans. Since there is a limit to the stresses in the rotating bodies, and then to their peripheral speeds, we can safely say that the pressures of a certain amount are more easily obtained with centrifugal fans instead of axial fans. The axial fans are much more noisy, it often happens that to contain noise the axial fan requires the use of silencers, where there would be no need for a centrifugal fan. These negative aspects are opposed to a lower weight, less space and lower cost. Use of axial fans in the low pressure range (up to 100 mm H2O) is much more frequent. Yields reached by axial fans, especially if of considerable size, are very close to those obtainable with the radial fans. 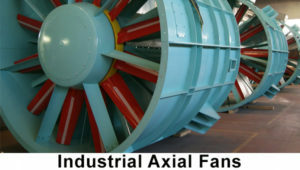 Another element that usually work for the use of an axial fan is the parallelism of the two suction and discharge nozzles and therefore its easy insertion in the plant, where the axial fan becomes nothing but a piece of the pipe, while the centrifugal fan requires a more expensive solution.A centrifugal fan can have a suction inlet (SWSI), or two suction mouths (DWDI). With the same number, diameter, rpm, specific weight and the total pressure, the DWDI fan have double capacity and absorbs twice the power compared to the single inlet. Not always the width of the double suction spiral is twice that of the single inlet. Tubeaxial fans have a wheel inside a cylindrical housing, with close clearance between blade and housing to improve airflow efficiency. The wheel turn faster than propeller fans, enabling operation under high-pressures 250 – 400 mm WC. The efficiency is up to 65%. Vaneaxial fans are similar to tubeaxials, but with addition of guide vanes that improve efficiency by directing and straightening the flow. These fans are designed for commercial and industrial applications where large volumes of air are required at moderate to high pressures. Vaneaxials are typically the most energy-efficient fans available and should be used whenever possible. Uses include heat, smoke and fume removal, process drying, comfort and process cooling and general ventilation. Propeller fans usually run at low speeds and moderate temperatures. They experience a large change in airflow with small changes in static pressure. 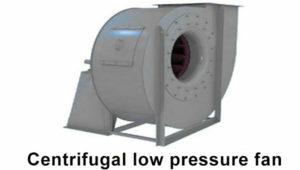 They handle large volumes of air at low pressure or free delivery. Propeller fans are often used indoors as exhaust fans. Outdoor applications include air-cooled condensers and cooling towers. Efficiency is low. 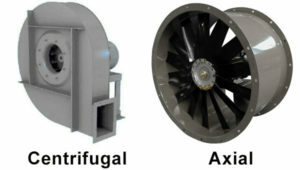 A particular type of axial fan is the bifurcated one, that can be directly coupled or driven by transmission. The purpose of this type of construction is to bring out of the flow the electric motor and the supports. This may be desirable for reasons like temperature or due to the corrosive properties of the delivered gas. They are in fact intended for installations for the extraction of hot fumes, humid and greasy atmospheres, in which the engine must be completely isolated from the fluid conveyed. In the case of high temperatures it cross ventilation of the electric motor (or the supports) can be provided.Such as are used for the extraction of air from kitchens, painting booths, furnaces, foundries. The choice of an industrial fan requires a deep examination of the characteristics of the system in which the fan is intended to be installed, as well as the knowledge of the technical characteristics of the fan that you want to buy. An exchange of technical information between the buyer and supplier it is often necessary to reach a purchase the most correct as possible, consistent with the actual buyer needs. It is the duty of the seller not only to sell a machine, but to understand the real needs of the client, that is to define the flow rate and the pressure for which the fan must be properly chosen. The efficiency is the ratio between the energy yielded by the fan and the energy input to the fan driving motor.